3rd New York Post article. tall on his hind legs. and his big bunny buddy, Bodmin, hop on over to Snopes. Paas and get the girls high as kites on Peeps and chocolate bunnies. 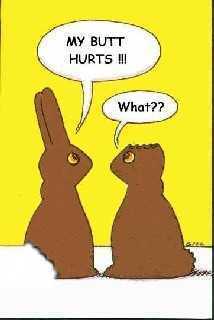 Speaking of chocolate bunnies; here’s a little holiday humor for you. That is one HUGE hare! Oh my God! Good to see you. I hope you enjoy sharing the holiday with all the young ones. Hope your fingers turned out cool! That’s a big ol’ bunny, whew. Yes its one of the funniest. I almost laught may *** off.